Zenbat Gara looks to the Basque homeland for inspiration and finds it in both the past and the present. The metaphors enacted through traditional dance communicate to us from the past on a preverbal level and connect us to our ancestors and to each other. Zenbat Gara's work is largely inspired by the folk ballet, Argia, from Donostia and the monumental work of its director Juan Antonio Urbeltz. We count ourselves very fortunate to have him as a friend and mentor. Over the years we have forged many friendships with dancers from Argia and other groups from Euskadi who have guided us in our search for authenticity. We are grateful to each of them. Several ensemble members have traveled to Euskal Herria and have experienced different dance traditions in their unique contexts. 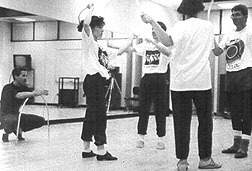 In 1991 Zenbat Gara's director was awarded a Folk Arts Apprenticeship from the Nevada Arts Council that allowed all ensemble members to study under Argia dance master, Jexux Larrea, and Atondu clothing expert, Ane Albisu, in Reno. This experience fundamentally shaped what we have become. 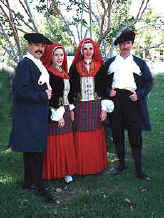 We have learned dances from different sources including video shot on visits to the Basque Country and from generous individuals. We thank Juan Antonio Urbeltz and members of Argia, especially Jexux Larrea, Ane Albisu, Iñaki Arregi, Agurtzane Arregi, Fernando Aristazabal and Amaia Bueno. Thanks also to Koldo Zabala and Mame Rodriguez Amunarriz of Oldarra, Jean Escoz, Imanol Galdos, John Ysursa, Miguel Mari and Felix Salaburu and Jean Louis and Annie Cihigoyenetche.